Russian company Arusoft has released a new version of its DeUHD ripping tool which bypasses AACS 2.1. The new encryption version appeared last month on the UHD Blu-ray discs of Fury and The Patriot and couldn't be bypassed with existing tools. The new version makes it possible for pirates to rip the discs in question, which happened soon after. The ongoing battle between copyright holders and pirates is often described as a cat and mouse game, especially when it comes to content protection. Hollywood studios release their movies with copy protection. Pirates break it. New protection is released. Pirates break it again. And so forth. With UHD Blu-rays, copyright holders have long had the upper hand in this game. The discs are protected with AACS 2.0 encryption which was long believed to unbreakable. This changed late last year. While the encryption technically wasn’t ‘cracked,’ at least not publicly, various pirated UHD Blu-ray movies were released. After several years behind, the ‘pirates’ were in front again. Not much later, another breakthrough came when a Russian company released a Windows tool called DeUHD that could rip UHD Blu-ray discs. While this was initially another win for pirates, bad news was on the horizon. Last month, the UHD Bluray releases of the movies Fury and The Patriot came out with a new encryption version, labeled AACS 2.1. This addition made it impossible to rip the discs and some feared that bypassing the protection could take a long time. 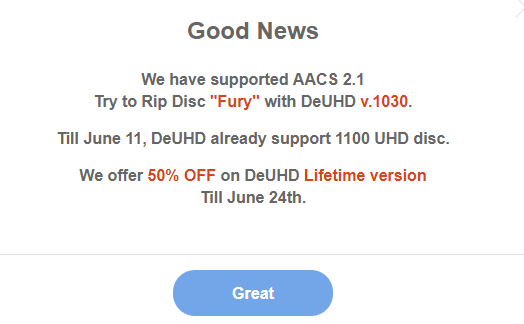 Yesterday, however, Arusoft released a new version of its DeUHD ripping tool that is now able to rip AACS 2.1 discs. TorrentFreak reached out to Arusoft who informed us that the AACS 2.1 discs come with a crucial difference. The main file has a fmts extension, an encrypted m2ts format, which contains forensic information. “[I]t’s extension is fmts instead of m2ts because it contains some extra info used by studios to track the player used for decryption, which is the major difference from aacs2.0 discs,” Arusoft notes. “It is not too difficult to bypass this protection, just takes some time to do it,” they add. While Arusoft doesn’t condone piracy, as MyCE notes, the new DeUHD release opens the door for pirates to share releases to a wider audience. 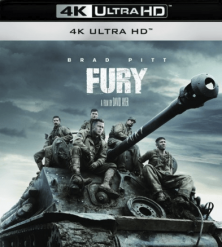 And indeed, a few hours ago several UHD Blu-ray rips of Fury have appeared online. Interestingly, there is some concern among the broader public whether this would be ‘safe’ or not. It’s obviously illegal, but the main worry is that AACS 2.1 presumably added forensic watermarks could help to identify the source of a leak. DeUHD’s developers, however, suggest that these data have been stripped. “All redundant data has been cleared from the disc,” Arusoft tells TorrentFreak. In a similarly worded statement, MyCE was informed that DeUHD “clears the garbage from the file” but other than that no definite claims were made. TorrentFreak previously reached out to the licensing outfit AACS LA to find out more about the new encryption. The company said it would review our request but has yet to comment. ‘First Pirated Ultra HD Blu-Ray Disk’ Appears Online. AACS 2.0 Cracked?